If you want to illustrate the reporting relationships in your company or organization, you can create a SmartArt graphic that uses an organization chart layout, such as Organization Chart, or you can use Microsoft Visio to create an organization chart. If you have Visio, you can read more about when Visio is the best way to create your organization chart. 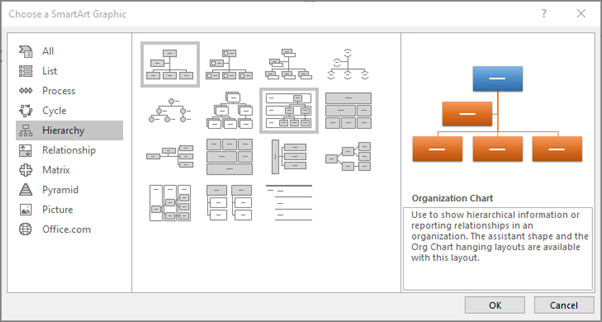 For instructions, see Create a Visio organization chart. Use a SmartArt graphic to create an organization chart in Excel, Outlook, PowerPoint, or Word to show the reporting relationships in an organization, such as department managers and non-management employees. 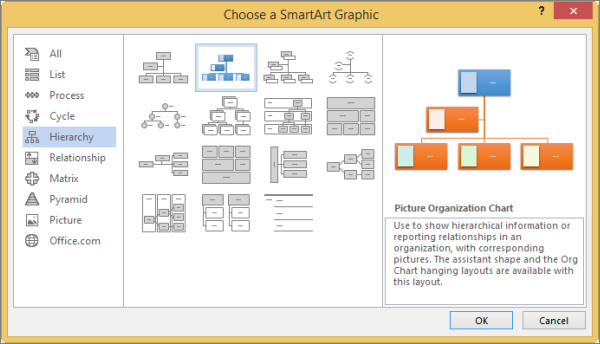 In the Choose a SmartArt Graphic gallery, click Hierarchy, click an organization chart layout (such as Organization Chart), and then click OK. If the Text pane is not visible, click the control on the edge of the SmartArt graphic. Important: This feature is not available in Outlook or in Office 2007. In your document, presentation, or spreadsheet, on the Insert tab, in the Illustrations group, click SmartArt. In the Choose a SmartArt Graphic gallery, click Hierarchy, click Picture Organization Chart or Circle Picture Hierarchy, and then click OK.
To add a picture, in the box where you want to add the picture, click the picture icon, locate the folder that contains the picture that you want to use, click the picture file, and then click Insert. To enter your text, follow the instructions in step 3 of Create an organization chart. Note: If you do not see the SmartArt Tools or Design tabs, make sure that you have selected the SmartArt graphic. You may have to double-click the SmartArt graphic to select it and open the Design tab. To insert a box one level above the selected box, click Add Shape Above. The new box takes the position of the selected box, and the selected box and all the boxes directly below it are each demoted one level. To insert a box one level below the selected box, click Add Shape Below. To add an assistant box, click Add Assistant. 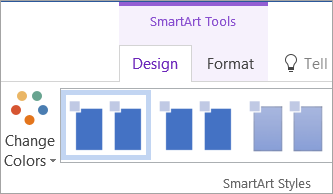 The assistant box is added above the other boxes at the same level in the SmartArt graphic, but it is displayed in the Text pane after the other boxes at the same level. Add Assistant is available only for organization chart layouts. It is not available for hierarchy layouts, such as Hierarchy. When you need to add a box to your relationship graphic, experiment with adding the shape before or after the selected shape to get the placement you want for the new shape. 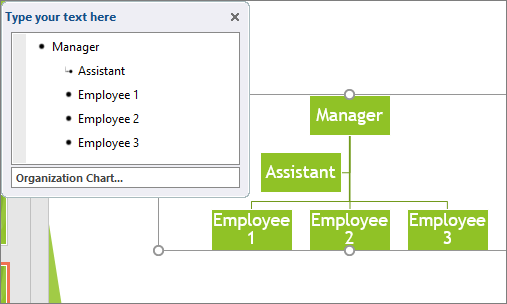 Although you cannot automatically connect two top-level boxes with a line in the organization chart layouts, such as Organization Chart, you can imitate this look by adding a box to the top level to your SmartArt graphic and then drawing a line to connect the boxes. (On the Insert tab, in the Illustrations group, select Shape, select a line, and then draw a line between the two boxes.) Learn more about drawing lines by reading Draw or delete a line or connector. To move a box, click the box that you want to move and then drag the box to its new location. To move or "nudge" the box in very small increments, hold down Ctrl while you press the arrow keys on your keyboard. To show a dotted-line reporting relationship between two boxes, change the style of the line between the two boxes. Click the SmartArt graphic whose line you want to change. Right-click the line, and then click Format Shape on the shortcut menu. A hanging layout affects the layout of all boxes below the selected box. 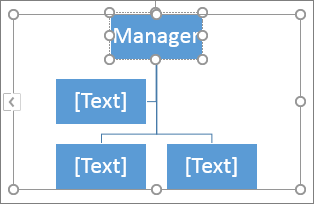 Although you can use other hierarchy layouts to create an organization chart, hanging layouts are available only with organization chart layouts. Click the box in the organization chart that you want to apply a hanging layout to. Note: If you do not see the SmartArt Tools or Design tabs, make sure that you have selected a SmartArt graphic. You may have to double-click the SmartArt graphic to select it and open the Design tab. To center all of the boxes below the selected box, click Standard. To center the selected box above the boxes below it and arrange the boxes below it horizontally with two boxes in each row, click Both. To arrange the selected box to the right of the boxes below it and left-align the boxes below it vertically, click Left Hanging. To arrange the selected box to the left of the boxes below it and right-align the boxes below it vertically, click Right Hanging. Right-click the border of a box, and then click Format Shape on the shortcut menu. Under Fill, click Solid fill. Click Color, and then click the color that you want. Tip: For even more effect options, such as shadow, glow, and reflection, under SmartArt Tools, on the Format tab, in the Shape Styles group, click Shape Effects, and then choose the effect that you want.